The General Meeting is composed of regular JPNIC members who support JPNIC’s goals and activities. The General Meeting passes resolutions on important matters regarding the administration of JPNIC, such as annual budget and financial statements, as well as election of Trustees and Auditors. The Board of Trustees administer the organization of JPNIC and conduct JPNIC activities approved by the General Meeting. The Auditors inspect the financial statements, the annual report and the state of the director's execution of activities. 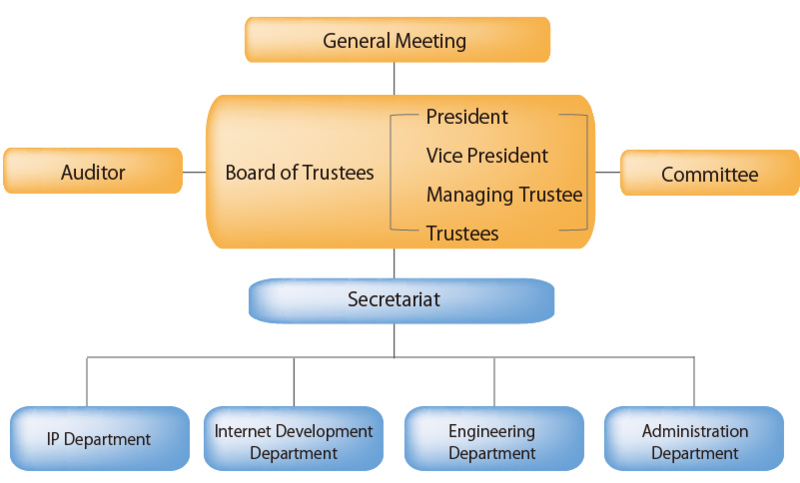 The Committees are composed of Trustees with specific expertise and/or external experts appointed by the Board of Trustees. They discuss important policies or put forward recommendations to the Board of Trustees on JPNIC activities. JPNIC's operations are conducted by the IP Address Department, Internet Development Department, Engineering Department, and Administration Department under the direction of the Secretary-General.